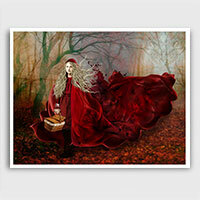 This giclée art print from my Fairy Tales and Folklore series is titled "The Company of Wolves". 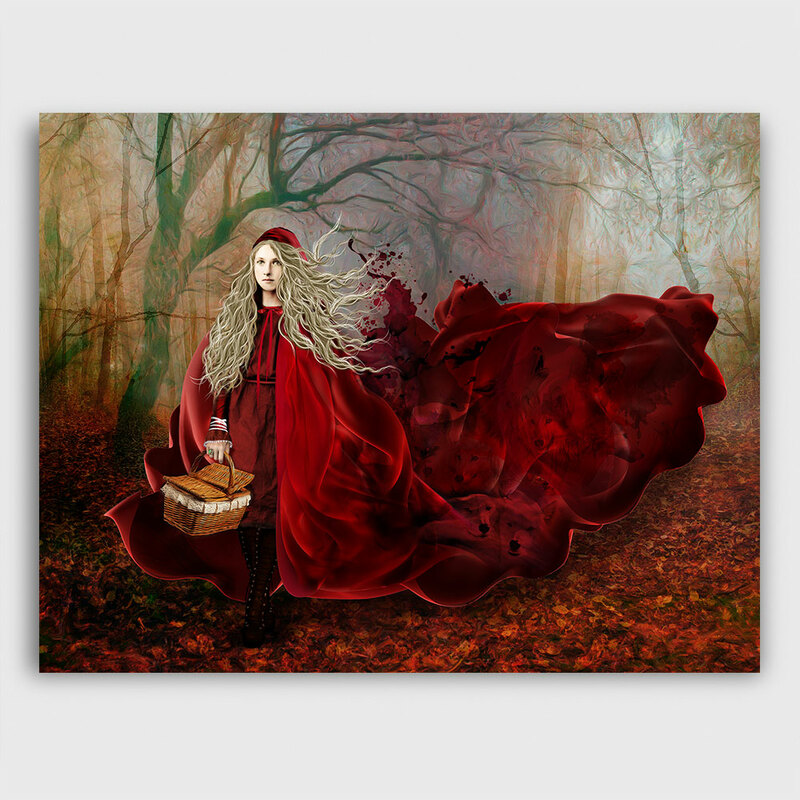 This piece was inspired by both the original Brothers Grimm tale and Angela Carter's dark and fantastic version of Little Red Riding Hood from the book The Bloody Chamber. To create this illustration I used a mixture of traditional and digital painting. In some versions Red Riding Hood is saved by a hunter. In some versions she kills the wolf herself. In some versions she is eaten by the wolf. Many versions, if not most have been foreboding tales in which to scare little girls into watching their backs. There is some consensus however that the tale is as much, if not more about Red Riding Hood discovering her own animalistic nature and overcoming it. 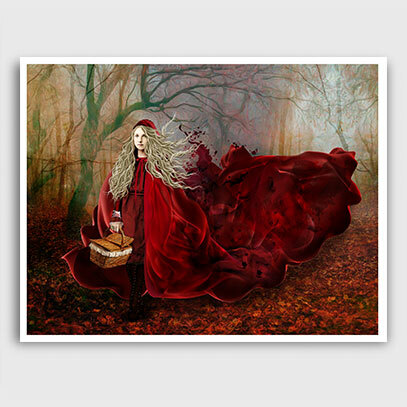 My Red Riding Hood is brave in the face of danger and wears her animalistic nature with pride. See "Details" and "Story & Style" for more information. Prints are available with or without a border. All sizes are signed on the back. Borderless prints will pop right into any standard 8x10 frame. These are readily available at stores like Michaels, Target, IKEA, etc. Prints are also available with a small white border for framing with a mat if desired. Borders approx: 8.5 x 11 prints have a 1/4" border, 14.5 x 19 prints have a 1/2" border, 18.5 x 24 prints have 1" border. I use one of the finest and most archival pigment based inks available on the market. This ensures your print stays brilliant and fade-resistant over time. The paper I use for my prints is a heavy weight Hahnemühle archival fine art paper. This is a matte paper that is 100% cotton rag, acid free and has the most lovely soft, old fashioned and museum quality feel to it. The paper not only has a beautiful richness but is also archival and fade-resistant. I take great care in my packaging to prevent your print from being bent or creased during shipping. My prints are shipped flat and well protected in an archival sleeve with a white chipboard backing,inside a bend proof mailer with additional cardboard flat pads for extra assurance. Red Riding Hood has been around a LONG time. Exactly when the "first" version was told may never be known for sure. One researcher, Dr. Jamie Tehrani, has concluded that the "original" tale might have been from the 1st century A.D. from a story more commonly known as "The Wolf and the Kids" and has evolved (or devolved, depending on your perspective), into at least 58 variations. Assuredly all of these variations have been filled with the morals, biases, fears, and judgements of each of the cultures from which they were retold. In some versions Red Riding Hood is saved by a hunter. In some versions she kills the wolf herself. In some versions she is eaten by the wolf. Many versions, if not most have been foreboding tales in which to scare little girls into watching their backs. There is some consensus however that the tale is as much, if not more about Red Riding Hood discovering her own animalistic nature and overcoming it. The Woods once again become a liminal space for this transformation to take place. Because of the protections placed on children in traditional society Red Riding Hood must leave the safety of those confines and enter a place where she can come face to face with her own demons and animalistic instincts if she is to ever come to know and defeat them. 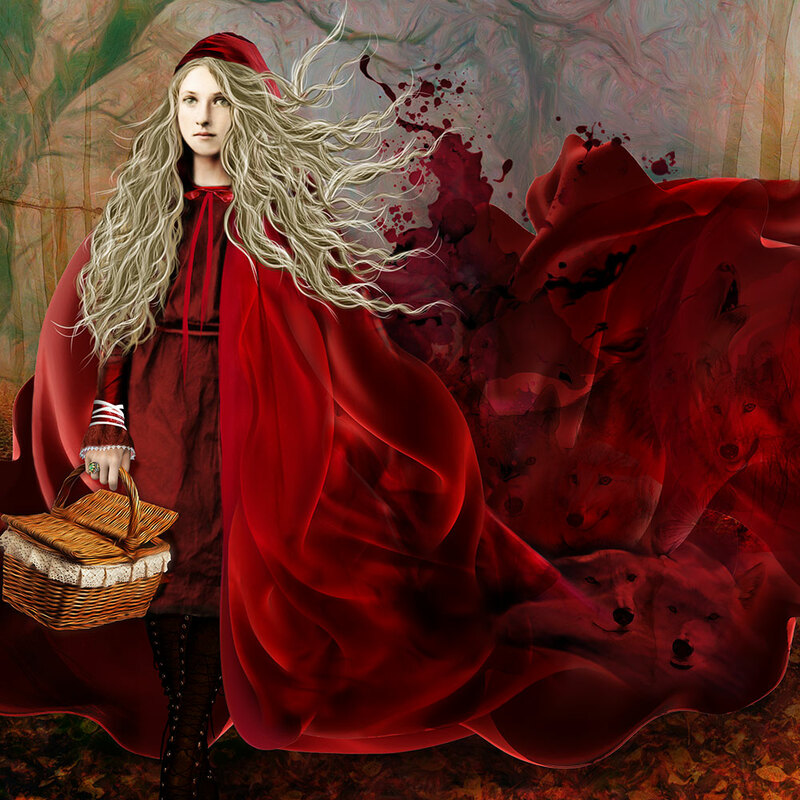 My Red Riding Hood is brave in the face of danger and wears her animalistic nature with pride. Prints are ready to ship within 1-2 business days.